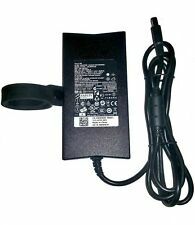 Genuine Dell 130-Watt PA-4E Slim AC Adapter INPUT: 100-240V 50/60Hz 2.5A OUTPUT: 19.5V ~ 6.7A WATTAGE: 130 Watts Model: DA130PE1-00 Family: PA-4E DP/N 0WRHKW Compatible Dell Part Numbers: PA-13 Family,PA-4E Family, WRHKW, 0WRHKW, VJCH5, 0VJCH5, CM161, 0CM161, JU012, 0JU012, D232H, D232H, 0VNM7N, VNM7N, MTMPN, 0MTMPN, X7329, X9366, 9Y819, W1828, D1078, K5294, NADP-130AB D .
Genuine Dell 130W 19.5v 6.7a charger, XPS 15 L501X L502X 15Z L511 CM161 VJCH5, Genuine Charger in good condition, comes with power plug. Original 130W Dell XPS 15 9530 9550 9560 9570 Adapter Charger Cord. Condition is Used. Dispatched with eBay delivery – Shutl 2-3 days. 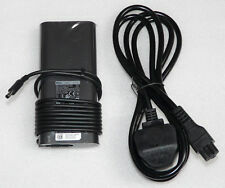 Dell DA130PE1-00 130w 19.5V Laotop AC Adapter P/N: JU012. Condition is Used. Dispatched with Royal Mail 1st Class. Genuine Dell 130-Watt PA-4E Slim AC Adapter. Compatible Dell Part Numbers OUTPUT: 19.5V ~ 6.7A. POWER ADAPTER AND UK CABLE. Inspiron 15R (N5010) Inspiron 15R (N5110) Inspiron 17R (7720) Inspiron 17R (N7110) Inspiron M5110 Inspiron 15. Genuine Original DELL 130W PA-4E AC Charger Power Supply. WRHKW Fully tested and working. No power cable supplied. Offered here at £18 Delivered PAYMENT SHIPPING RETURNS PAYMENTSHIPPINGRETURNS We accept payment by any of the following methods: PayPal Orders placed and paid before 2pm will be dispatched on the same working day. We offer FREE shipping on all orders. We use Royal Mail 2nd class to ship most orders. If you require next day delivery, please send us a message and we will try to help! Due to the nature of used / refurbished products, sometimes there can be problems. If you are unhappy in any way please contact us first and we will do our best to find a solution that best fits you. We offer a return to base warranty on all items. $Click here to see description. Original Dell 130W DA130PE1-00 19.5V 1.58A Laptop AC Adapter & Power Lead. In such a case we may make a reasonable deduction to cover the loss of value of the product. MODEL NO: LA130PM121. ORIGINAL DELL AC/DC ADAPTER. AS IM WILLING TO 100% COMMUNICATE AND. IS DIFFERENT! UK MAINLAND. IF OUT SIDE THE. UK MAINLAND ONLY. SORT OUT THE ISSUE STRAIGHT AWAY. 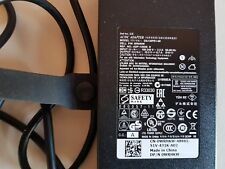 Genuine Dell 130-Watt PA-4E Slim AC Adapter. AC adapter only, no power lead. Dell Laptop Power AC Adapter Model LA130PM121 130W 19.5V 6.7A. Condition is New. Note you can use a higher Watts adaptor than is advertised for your laptop. Compatiable Part Numbers. Compatible Models. 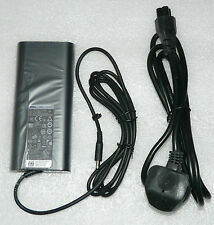 Genuine NEW DELL 130W watt Laptop AC Adapter Battery Charger. Dispatched with Royal Mail 2nd Class. Collection in person is usually permitted. Collection in person We do not accept Scottish currency. We do not accept any foreign currency. Genuine Dell part. Dell PA-4E PA4E PA-13 Family 0JU012 0CM161 0X9366 LA130PM121 0MTM121. The product advertised here uses a 3-pin (C5) power connector. NEW GENUINE DELL LA130PM121 19.5V 6.7A 130W LAPTOP ADAPTER CHARGER. Dispatched with Royal Mail 1st Class. Dell P/N: JU012, WRHKW, CM161, VJCH5, MTMPN. -Precision 3530. -Precision 3510. THIS ADAPTER FITS THE FOLLOWING SYSTEMS -Precision 3520. -Precision M4500, M2800, M4400. -Latitude E6540, E6400. -Inspiron 17R (N7110), 15R (N5110), M511R (M5110), 15R (N5010), 7000, Inspiron 15 (7567). DELL LA130PM121 130W 19.5V 6.7A. DP/N: 0JU012. MAX OUT: 130W. USED IN GOOD CONDITION. UK MAINLAND ONLY. , VJCH5 M55GJ HG5D1 P7KJ5. -Inspiron 17R (N7110), 15R (N5110), M511R (M5110), 17R (7720), 15 (7559), 15R (N5010), 7000. 19.5V 6.7A 130W Power AC Adapter. - Dell P/N: JU012; MTMPN, CM161, 0CM161, WRHKW. GENUINE Original DELL 130W PA-4E AC Adapter. 19.5V 6.7A, 130W. Dell P/Ns : JU012, CM161, MTMPN, VJCH5, WRHKW, DHYM1, 450-19105. Dell Inspiron- 300m, 500m, 510m, 600m, 630m, 640m, 700m 710m 6000 6000D 6400 8500 8600 9300 1150 5150 5160 1318 E1405 E1505 1501 1420 1520 1521 1525 1720 1721. These AC Adapters are Genuine Original DELL. 4.5mm SLIM Plug. Dell P/Ns : 7CWK7, M1MYR, 662JT. Goods are sourced from Dell Outlet or other channels. Variation in these will invalidate warranty. Extended warranties available. We are I.T Recyclers based in the West Midlands. 7.4mm barrel size, In good condition. Tested working. In reality this is likely to be within 24 hours dependant on how busy we are. DP/N 0WRHKW. PA-13 Family,PA-4E Family, WRHKW, 0WRHKW, VJCH5, 0VJCH5, CM161, 0CM161, JU012, 0JU012, D232H, D232H. Genuine Dell 130-Watt PA-4E Slim AC Adapter. Compatible Dell Part Numbers Inspiron 15R (N5010) Inspiron 15R (N5110) Inspiron 17R (7720) Inspiron 17R (N7110) Inspiron M5110 Inspiron 15. VJCH5 0VJCH5 CN-0VJCH5 LA130PM121. Dell Part Number: VJCH5 0VJCH5 CN-0VJCH5. Model Number: LA130PM121. AC adapter 130W. Dell 130W 19.5V 6.7A. & 6ft power cable. Includes 6ft power cable. Genuine DELL with cable strap. 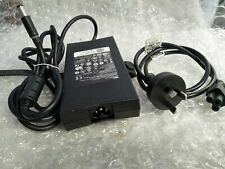 DELL AC/DC POWER ADAPTER LA130PM121 19.5V - 6.7A 130W, A1. Genuine Dell 130W AC power adapter, LA130PM121. We are I.T Recyclers based in the West Midlands. Variation in these will invalidate warranty. Genuine Dell Original 130W 19.5v 6.7a PA4E PA-4E (7.4x5.0 mm with Pin tip).